[SunWind] (Edit 2018: who now goes as [nerdaxic]) developed his own version of the Phillips Ambilight system which he is calling LiveLight. 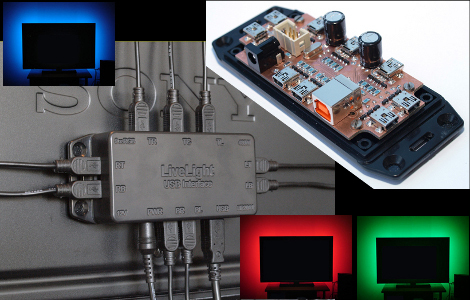 We’ve seen more than a few of these hacks, many of them are based around Arduino, and most use LED strip lighting. [Nerdaxic] is using strip lighting as well, but his design is clean and polished quite a bit more than anything else we’ve seen. In our minds this would be welcomed by even the most discriminating of A/V enthusiasts. He found just the right size of project box and managed to fit everything in on a nicely milled PCB. The enclosure itself has also been milled to allow the mini USB B connectors for each of the nine RGB LED strips. But he didn’t stop there, the top of the enclosure has labels milled into it to help when hooking everything up. An ATmega32 addresses the LED strips based on data pushed in from a computer. An on-board FTDI chip adds USB connectivity and [nerdaxic] used a hack to rewrite the EEPROM on that chip so that it enumerates with the name “LiveLight USB Interface”. A program called Boblight gathers the data from the currently playing video. You can see the final project in the video embedded after the break. I thought this was the worlds fullest USB hub at first…. I want one. How much do I have to pay for it? I don’t care to do the build work myself besides just the soldering if need be. But I definitely want one. Respond with an email address of how I can order one and the cost and I will pay up for it right away. This thing is great. Espie: tap into the VGA/component video, use three integrating op-amps to determine how much R/G/B there is in the signal. Makes the screen look so much bigger. I might have to squeeze this in once I finish up some of my other projects. …I’ve wanted to make one of these for my projector for years – I just picked up some addressable led strips and they’d be perfect, but again, the problem is in getting the data. I was tempted to install a webcam that just WATCHED the projected image and built the colour wash accordingly. @espie and others – I second the HDMI passthrough idea – this is a great attempt but I don’t think it would ever reach the home user market if you had to use a PC running a secondary program… not that I think they’re aiming for a home user market, but with a product like this I think they could/should…….. The problem with HDMI passthrough is HDCP; AFAIK, the PS3 won’t play BD’s (not sure about games) through HDMI without an HDCP monitor. What about some unobtrusive (fiber coupled?) light sensors at the edges of the screen? One way, might be able to use a simple R/G/B sensor pointed at the screen to pick up the “average” color of the screen, and transfer that to the LED driver. Not a great solution, but it’d get rid of the PC. But the project itself is a fantastic build. Great box, nice finishing touches, nice PCB. Very good quality work done here. I’d like to see more work from this user. Man, sure is nice to see a quality job, over those rats nest wiring jobs from hacks. Really, it doesn’t take that much longer to do some nice wiring. You don’t have to have milled enclosures, just a nicely done project. Would be a lot better if, instead of screwing around with FTDI crap, he’d just used an ATmega32U4. FTDI has publicly available software that lets you customise the name of your device. No need to hack that part. Very nice, Iv’e seen Phillips flat panels with this technology when they first came out, this is a very good copy. By the way: Philips only has one ‘L’. Apologies if this double posts – I posted earlier and it hasn’t shown up. I built something like this, but I wanted it to work with all my sources, including HDCP encrypted digital ones, and thus the PC based solution wouldn’t work. I opened up my video processor (which is external to the TV in my case) and found the pin-out for the HDCP decoder. I tapped the digital signal from that before it gets re-encrypted for output. It works great, even on PS3. Sensors pointing at the screen are probably never going to work very well due to the difficulties of getting accurate colour, ambient lighting and reflections in the screen, and general overhead and lag. It would be nice if it could read ahead and then anticipate and change gradually. Right now, it’s impressive but you can really notice the slight delay. The colors on screen change and then the backlight radically alters to match – with a slight delay. mhmmm seems quite good but this kind of system is all well and good but you need a dedicated pc to run it and even then….. it looks a bit laggy for a cinema enthusiasts taste (mine included) really these projects need some sort of hdmi passthrough for this to be useable/cost efficient for 99% of people again this includes myself ive spent well over £2500 on my cinema setup but another £500 to implement a backlight? id rather not…. but hey rome wasnt built in a day and commendable effort guys the colour rendering looks great and definately rewflects the on screen action quite well, id like to see it operating on a fast cut action scene though to see how it can cope with fast transitions. A HDCP Stripper Setup or this TV http://hackaday.com/2009/10/01/tv-hack-bypasses-hdcp might help getting rid of the PC. Maybe the delay can be fixed if you delay both the sound and image with a certain value to compensate… I really don’t know how to do that. HDMI passthrough will never work…. Why? because hollywood is a bunch of morons. the brain dead HDCP that protects NOTHING is required on a lot of garbage that makes such devices impossible. Unless people STOP buying HDCP required content and HDCP enabled equipment and screams at the manufacturers about it it will only get worse. Why not use the video-out signal in the SCART on the tv ? The HDFury is a fairly inexpensive dongle that will convert HDCP-protected HDMI to VGA. So going from an HDMI source to a splitter, then to the TV and HDFury. The HDFury would then be connected to a VGA based version of this thing. One of the main problems with doing the VGA processing is you don’t want to just average the scene but average the color in quadrants around the edges. I think it’s probably a job for an FPGA but I have never really looked into it. Do you think that would be good enough to get a decent VGA output for external processing? I think that might be the best idea for my setup, since my receiver switches all HDMI sources into one output, so I could use it with all my content. Of course I would have to design a board to decode the VGA and average the colors. @espie: I was just thinking the same thing. If you stuck with YPbPr (component) cables, you could do this fairly easily, the only difficulty would be filtering out the sync signal on the Y channel, but you could do it all on an analog level, without even needing a microcontroller, let alone a PC. But that would only give you one value for RGB, not what looks like at least 4 in this implementation. Couldn’t you mirror the video signal and just stick an old monitor/LCD screen behind the TV showing the same video? Seems a lot simpler to me and old flat screens are getting pretty cheap nowadays. Maybe use mirrors to direct the light outwards. If someone would like so see the origin of this project. This can be found here, it’s about 80 pages (translated from Dutch). All info can be found here. I myself made the first version with 3 Led Bars and is working nicely.